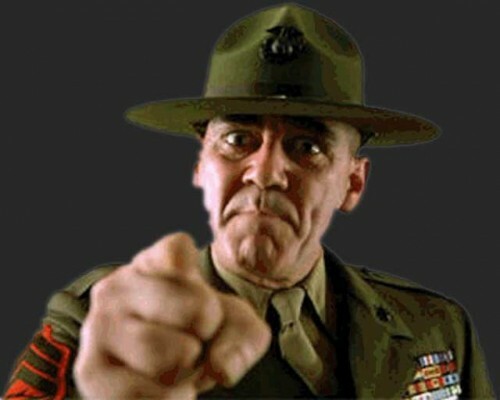 Your ds106 sergeants are not pleased. Y’all talk about being creative, about how great ds106 is… what are you doing? We had the geeky privates run some data analytics. Look how active the troops are? An average showing of 2.57142857142857 daily creators per day last week? It’s time to get in shape. We give you a ds106 daily create summer creative challenge-… because your creativity has gotten FLABBY! Do you do anything more than clicking to like comments on Facebook or retweet cat videos on twitter? Who is ready to go to Creativity Bootcamp?? Make something every day, 15 minutes per day. Are you THAT busy? Too busy to make art? You? You? YOU? DO I NEED TO NAME NAMES? YOU DONT WANT ME CALLING YOU OUT ON THE GROUND TO DO PUSHUPS DO YA? AM I YOUR MOMMA? See how many ds106 Daily Creates you can do in July. No prizes, badges, or any crap like that. Just the reward of getting your creativity back in shape. We are not counting. Well but is it for June 2017 or for July 2017? Because 30 days in June but only 31 in July and it might be a stretch for some (like UNCLE @jimgroom) if he had an Art Lack. plus, you said “some weird doll.” I’m Still Watching #TrueFiend. I’m defying calendars, when did you get to be so rule-based conventional? pssst! that’s a link to the old daily create site at the bottom…. Psssst. I’m a post from 2013.